The annual Best New Scientific Instruments awards are presided over by 60 senior experts. A total of 253 Chinese and foreign equipment manufacturers submitted 587 new scientific instrument applications for this award. A committee selected 166 instruments according to their innovation, market outlook and user comments and finally 26 instruments were elected and recognized as the Best 2014 New Instruments. 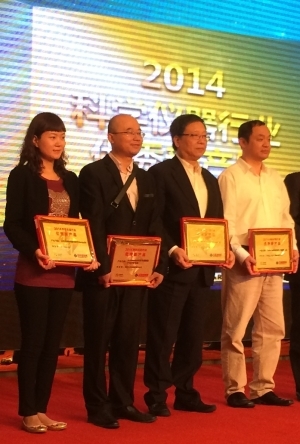 "We are honored that our Autopore V Mercury Porosimeter was recognized as one of the best new scientific instruments in 2014," said Dr Ren Xu, general manager of Micromeritics Instrument (Shanghai). Dr Ren Xu, the third from the left in the photo, received the award during the Annual Conference of China Scientific Instrument 2015.